I’ve had a lot of requests for a breakdown of my DSLR cinema rig. In this video I’ll share with you how I assemble it. You can easily modify the rig to fit almost any shooting need like switching the handle around, removing the cage and camera for light shooting and more. 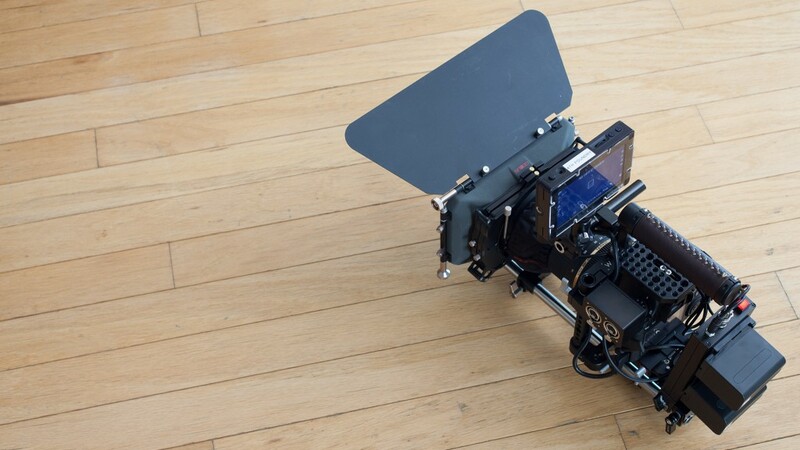 Here is a list of parts that make up this DSLR cinema rig. I use the Wooden Camera Quick Cage and swear by it. You can get this cage for small, medium and large cameras. On the cage I have the Wooden Camera A-Box. For rods I’ve been using these 12 inch stainless steal 15mm rods from Redrock. I’ve had them for 4 years now and they have been troopers. For the matte box, I use Genustech gear. They have the best lightweight, quality and affordable matte boxes I’ve found. In this video I showed you the PV matte box, but the Genus Matte Box Lite is also a great option. I’ve been using this battery plate for a while and really like it. It allows me to use cheap Sony NP-F970 batteries with my DSLRs. You can also add this SmallRig rod clamp to make the plate a little more stabile. This is a custom mount I’ve made with random parts I had laying around. You can watch my how to tutorial for it here. So thats the cinema rig. I’d love to see what you guys have made using various rigs and parts. Share a link here or on our Facebook page! Although I don’t use a matte box or external battery pack, I love the look of your rig. Do you ever mount a shotgun mic or recorder directly to the rig? My system is nearly rod-less because we shoot video and stills withe the same three cameras simultaneously. Cameras stay relatively naked but monitors and follow focus systems are built on to tripods and monopod (via 4dslr tripod studs). So good! Thanks I’ve been really curious about this for awhile! No follow focus though? I am using a nikon 3200 and want to add some more power. 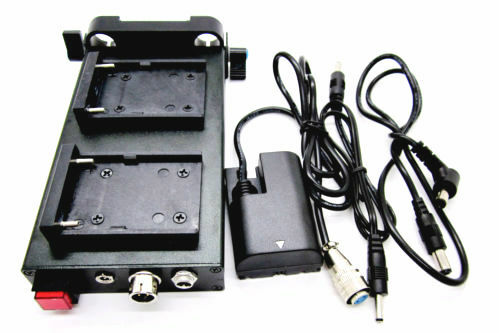 If I pick up your Vello battery grip which is made for the 3200 what size cage wooden camera cage would I need? The website says Large but they are using a 6d in their photo and wasn’t sure if It applied to the 3200. Also do they make your sony external battery for nikons? You probably want the large. Although you could use the small or medium and change the rod out for a longer one. Maybe shoot an email to wooden camera and ask for their opinion. Thanks and also does your external battery have nikon models? That model only comes as canon, there is the Nikon EP-5A power supply connector you need to buy to deliver power to camera. I think switronix makes ones as well. Neither are as elegant a solution as the battery plate above. Hey wanted to know if you use this setup to put on your shoulder. 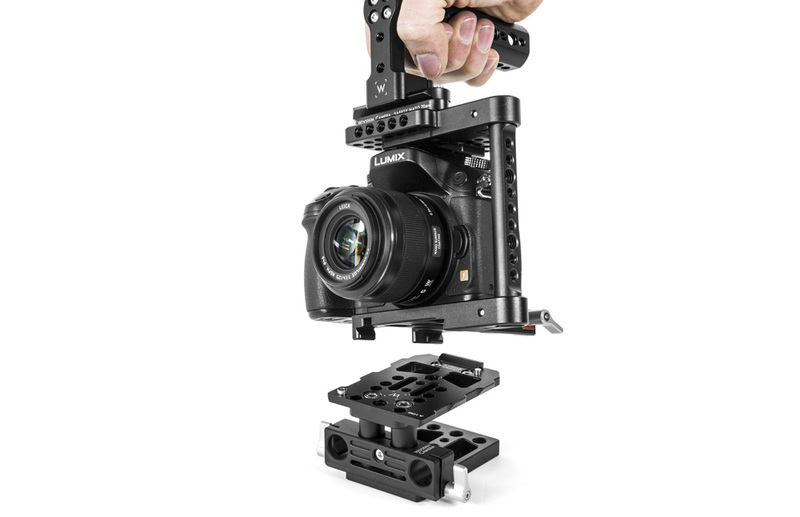 I’ve been looking to build a setup like this similar to shane hurlbut’s master cinema rigs where the body of the camera rests on your shoulder not infront on your arm’s because it puts a lot of the weight of the camera and then-some on your hands which causes people to get fatigued easier. This looks like the setup i’m looking for was just wondering if the camera body would fit perfectly on my shoulder like the master cinema series rigs. Yes, this is setup so all you have to do is add a shoulder pad and handles. Boom. Done. 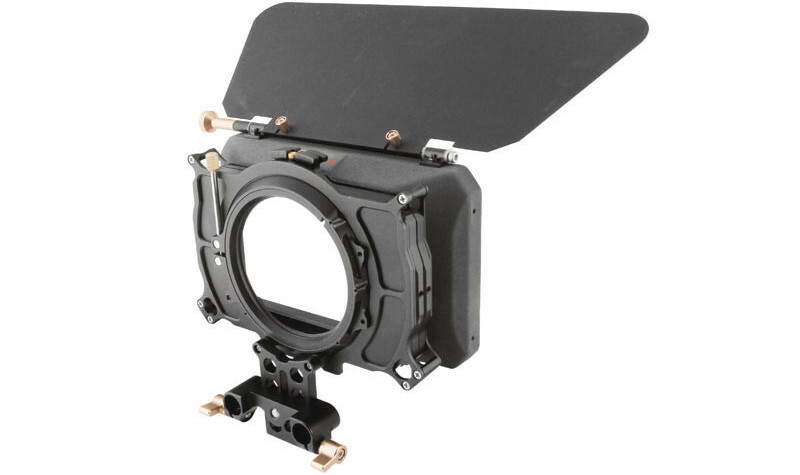 Hey Caleb, do you know any more affordable “C shape” cage like the wooden camera quick cage? I just wanted to tell you that you’re such a great inspiration when it comes to gear and rigging up cameras! You keep it so compact and good-/professional-looking and don’t just focus on the cheap stuff, but a mixture of cheap, expensive and quality products! Keep up the awesome work! Thank you for the kind words. It is aways encouraging to hear things like that. Have you used the DP4-EVF on this rig? I trying to decide between the DP4 and the DP4-EVF. Any ideas on what is better? I Actually used to own the EVF loupe, but ended up selling it. I just wasn’t using it. You could definitely make that work though! Hello, I am wondering about how much does your rig weigh in total? Most of these cameras share the same voltage, I’ve just bought the same plate with one type of battery for 1 camera, and i’m simply going to build the other. You just need a dummy battery for your camera (always about on ebay) and the 2 pin connector for the other end which you can get from any electronics store. Is there any battery pack you can recommend for my Sony A77? The Sony has a funky square style plug that you can buy a wall plug for. I need to be mobile and not hindered or restricted to a wall plug. The power output should be 7.6V DC 3 amps 29 watts. Hi there Caleb, thanks for the all info you put it out. I think the wooden camera systems are awesome but i couldn’t figure out how do you managed to use Rosette Handle with Wooden cam. Medium camera support kit? i almost check every option they provide on their website but i cant find out the rosette handle option with the medium camera support kit. Could you share your secret please? The cage with the rosette handle looks great..
thanks for the answer Caleb!